The hospital apologised to Eoin McCallig from Dunkineely in Co Donegal, and his parents for his injuries and for the devastating consequences for the family. Mr McCallig said the HSE had spent €800m over the last ten years in fighting these cases and he said the money could be put to better use. He said the settlement of €15m would never change what happened to Eoin, but it would give them some comfort as they knew that if they died, Eoin would be looked after. Mr Justice Kelly said no amount of money would compensate for the catastrophic injuries suffered by Eoin, but the settlement would allow him to be sufficiently supported in his life. He said he echoed Mr McCallig's comments and said there must be a better way of dealing with these cases than trials in the High Court, before making admissions just before the trial date and making offers on the morning of a hearing. He said there must be a better way than litigation to the bitter end. The court heard the Coombe Hospital stopped monitoring Eoin's heart rate at 9.30am on the morning of his birth. The parents alleged that if he had been monitored further, medical staff would have seen he was in distress. He was born at around 11.30am and the court heard he had been deprived of oxygen in the 20 minutes just before he was born. If he had been monitored and delivered early, he would not have suffered such injuries, the court heard. The court was told Eoin was a very bright boy who will be five years old on Friday. But he cannot walk or talk and can communicate only with his eyes and expressions. Speaking on RTÉ's Six One News, Mr McCallig said a "ludicrous culture" exists within the HSE. "We are one of the lucky ones," he said. "There are a lot of kids that are ten, eleven and twelve years old before they reach settlement. 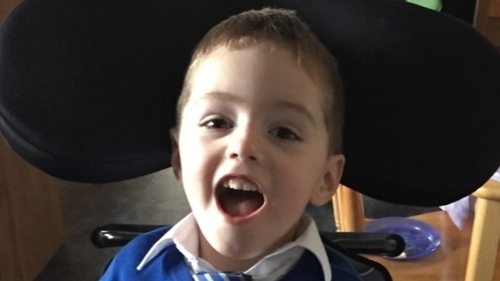 "Early intervention is crucial when you are dealing with kids, like Eoin, with cerebral palsy. If we had that money at the start and other kids had that money at the start, you'd be all over the world trying things to give him the best outcome you could." Mr McCallig said the HSE could have better spent the money used to fight challenges on improving the effectiveness and efficiencies of hospitals. Meanwhile Ms McCallig said their son did not deserve this, describing him as "the light of our lives". She added that the family have been under tremendous strain in recent years and have been living in rented accommodation because they did not know if their legal costs would be covered.